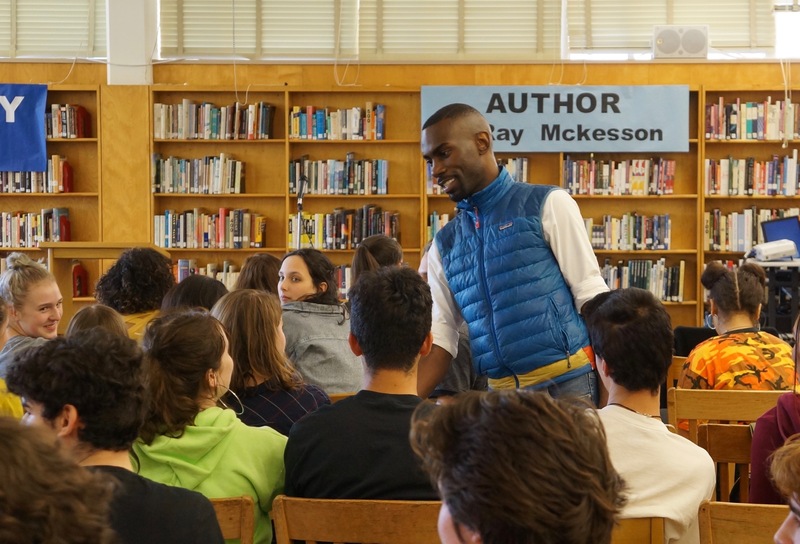 DeRay Mckesson’s afternoon talk at Grant High School got started a little late because the staff had to keep setting up more and more chairs. The library eventually filled to almost 200 students, and meanwhile Mr. Mckesson, wearing his signature blue vest, walked up and down rows of kids, shaking hands and saying hello. Two members of Grant’s Black Student Union welcomed Mckesson with brief remarks, and then he jumped right into a few stories from his 400 days in Ferguson, MO and the beginning of the Black Lives Matter movement. His stories moved gracefully from anecdote (the Five-Second Rule, getting tear-gassed, meeting with President Obama) often landing on a note of a gentle good humor that caused laughter, although he just as often landed on hard-core information. Fifteen minutes in, he opened up to questions, and a rich conversation followed; students were not shy about raising their hands. He ended with a warm thank you to the students, specifically to “…your generation…” and took a pictures of the whole group for his Instagram page as students jumped to their feet and waved and cheered.